Sizes include 40" x 32", 37" x 37", 48" x 40", 44" x 48"
Optional rubber grommets or lips keep product from slipping. 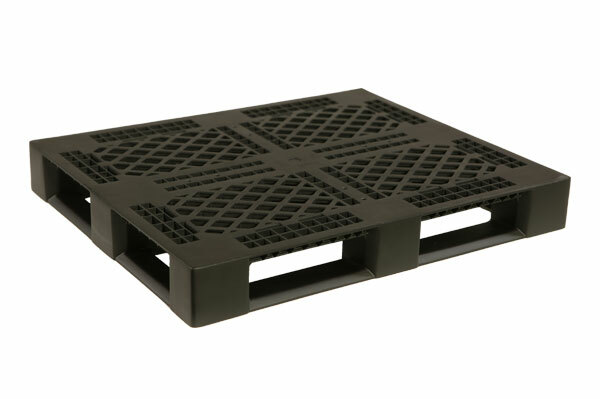 These rackable pallets feature a picture frame bottom with runners on all four sides for stablilty, making them ideal for use in warehouse racking systems. They are engineered so that the bottom pallet can handle the full static load when loaded pallets are stacked 2 or more high, and offer unsupported rack capacities up to 2,800 lbs. Rackable pallets are widely used in stack loading, closed top transport, floor storage and automated material handling equipment throughout many warehousing, general material handling, distribution center, and returnable shipping applications. Product No. Dimensions Height Weight (lbs.) Dynamic Load Static Loading Cap. (lbs.) Racking Loading Cap. (lbs.) Price Ea.